DAVENPORT — A Memorial Mass for Mary J. Nolan, 86, a resident of Davenport, will be 1 p.m. Thursday, June 29, 2017, at Sacred Heart Cathedral, 422 E. 10th St., Davenport. The family will greet friends at church from 11 a.m. until the time of the Mass. Burial will be in Davenport Memorial Park. Mary passed away Tuesday, June 27, 2017 at Good Samaritan Nursing Home, Davenport, surrounded by her family. Mary J. Gadd was born June 1, 1931, in Storm Lake, Iowa, a daughter of Clem W. and Elaine (Murphy) Gadd. She married Robert C. Nolan on January 12, 1957 at Corpus Christi Catholic Church, Fort Dodge, Iowa. He preceded her in death on March 17, 2004. In her younger years, Mary had worked in the emergency room department in admissions at both local hospitals. 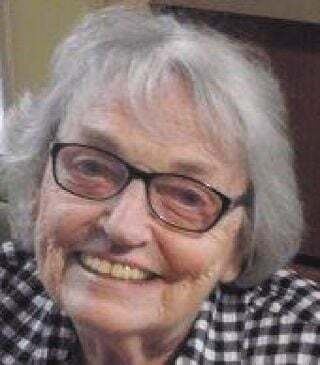 She was the religious education coordinator for many years at Sacred Heart Cathedral and worked for the Diocese of Davenport at St. Vincent’s Center as a media/resource coordinator and also for the Catholic Messenger. Mary adored her large family, cooking for them, and all the times they were together. She enjoyed journaling, reading and music, especially jazz. Mary cherished and celebrated her Irish heritage. Sacred Heart was a big part of Mary and Bob’s life. Mary helped bring the RCIA program to the diocese, and served as a Eucharistic Minister and lector at the Cathedral. Memorials may be made to the family to plant a tree in Mary’s honor at a later date. Those left to honor Mary’s memory include her children, Mitch Nolan, Green Bay, Wisconsin, Amy (Todd) Garstang and Martha Nolan, all of Davenport, Sally (Kevin) Leonard, Newport News, Virginia, Molly (Rick) Lockridge, Rogers, Arkansas, Pat (Wendy) Nolan Bella Vista, Arkansas, and Mickey Nolan, Chicago; grandchildren, Frank (Sarah) Nolan, Sam (Leeya) Nolan, Stacey (Ryan) Sheckler, Bridget (Justin) Hedgecock, Claire (Dustin) Stichter, Lacey Nolan, Joey Lockridge, Quinten Lockridge, Taylor Nolan, Bailey Nolan, great-grandchildren, Olivia, Ella, Brett, Jacob, Emily, Owen, Evan, Natalie, Madeleine, Michael, Sawyer, and Bodhi; a daughter-in-law, Terry (Annette) Buerschinger-Nolan, Boca Grande, Florida; and a sister-in-law, Jo Nolan, Johnson City, Tennessee.